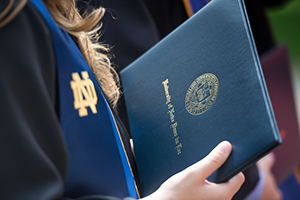 In addition to the 15 University of Notre Dame senior recipients of Fulbright fellowships, the National Science Foundation and other organizations have awarded scholarships and fellowships to 15 members of the University’s Class of 2016. The following students received National Science Foundation Graduate Research Fellowships, which provide funding for research-based study leading to a master’s or doctoral degree in science (including social sciences), technology, engineering and math (STEM): Kenzell Huggins, anthropology, Jacksonville, Florida; Brian Keene, chemical engineering, Snohomish, Washington; Ellen Norby, biochemistry and Glynn Family Honors Program, Bloomington, Minnesota; Joseph Norby, mechanical engineering, Bloomington, Minnesota; Toby Turney, biochemistry and Sorin Scholars Program, Talihina, Oklahoma; and Melanie Wallskog, economics and Glynn Family Honors Program, Timnath, Colorado. John “Jake” Grefenstette, a theology student, Hesburgh-Yusko Scholar and Glynn Family Honors Program student from Pittsburgh, received a fellowship from the Yenching Academy, funding a one-year master of China studies program in that prestigious college within Peking University. Charlie Ducey, an English and German student from Portland, Oregon, and Clarisse Wilson, a music performance student from Cordova, Tennessee, received Austrian Teaching Assistantships, which provide prospective teachers of German and/or graduates interested in Austrian studies with opportunities to work at secondary schools throughout Austria. Ethan Beaudoin, a political science and Arabic student from Ballston Spa, New York, received a Boren Award for International Study for study in Turkey. Michael Dinh, a biological sciences, psychology and Glynn Family Honors student from Maricopa, Arizona, and Ellen Norby, a biochemistry and Glynn Family Honors student from Bloomington, Minnesota, received Goldwater Scholarships for outstanding sophomores and juniors who have exceptional potential and intend to pursue careers in mathematics, the natural sciences or engineering. Sociology and Spanish student Ray’Von Jones of South Bend, Indiana, and Bright Gyamfi, a political science and history student and Sorin Scholar from Grand Prairie, Texas, received Benjamin A. Gilman International Scholarships for study in Toledo, Spain and London, respectively. Chinese and chemical engineering student Rose Doerfler of Pittsburgh received a Critical Language Scholarship for a language and cultural immersion program in China. Originally published by Michael O. Garvey at news.nd.edu on May 13, 2016.